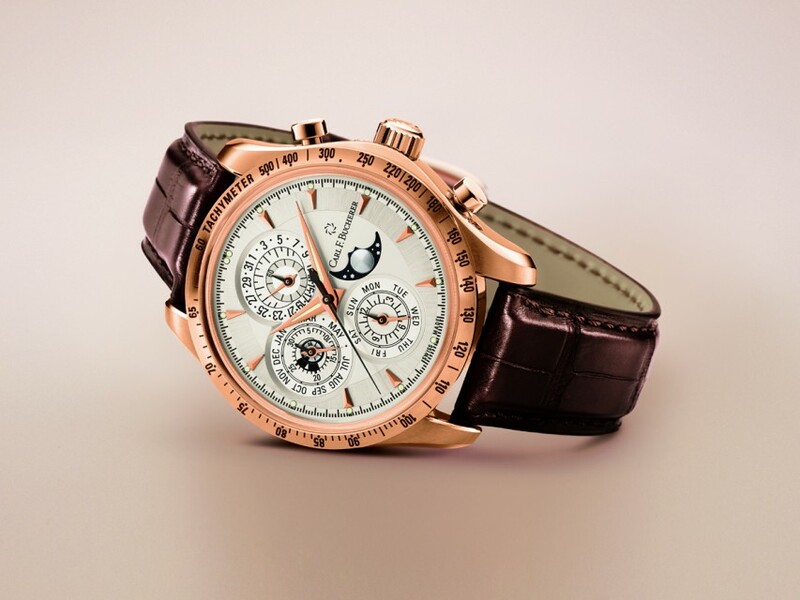 From giant watchmaker Carl F. Bucherer comes the Manero ChronoPerpetual Limited Edition for 2014. This immaculate looking timepiece was released at Baselworld earlier this year. The Manero ChronoPerpetual Limited Edition is made in an exclusive series of just 100 pieces worldwide. This isn’t the first Manero ChronoPerpetual from Bucherer, but it does carry a brand new aesthetic that many friends of the brand are already calling a hit. One of the major updates to this watch is the tachometric scale that has been engraved on the bezel. On earlier incarnations of the Manero ChronoPerpetual, the tachymeter was found on the flange. Looking across the range of watchmakers able to create a perpetual calendar chronograph watch, this is the first time that an engraved tachymeter is seen on the bezel, making this timepiece a bit of a collector’s item. The case is featured in 18kt rose gold, brushed and polished for effect. The main crown is ridged, while the chronograph pushers are classically T shaped. Securing the watch to the wrist is a dark brown alligator leather strap, fastened using a pin buckle also crafted from 18kt rose gold. The case carries dimensions of 42.5mm for the diameter, and 14.3mm for the case height. All in all, this is quite good given all of the complications that this watch contains. The case back uses a sapphire crystal so that the movement can be seen. Protecting the dial is another sapphire crystal. However, this crystal is made anti-reflective and is highly convex in its shape. The dial features rose gold toned triangular indexes marking the hours. The hands are also rose gold toned but also carry lume for the readability of the time at night. Unique to the Manero ChronoPerpetual line is a moon phase aperture at the 3 position angled neatly at 45°. The subdials at 6, 9, and 12 display both the chronograph and perpetual calendar complications. The subdial at 12 reveals the date and the continuous seconds. The subdial at 6 counts the chrono hours and displays the day of the week, while the counter at 9 indicates the chrono minutes and both the month and leap year indicator. The chronograph seconds are counted off by a central hand. Carl F. Bucherer makes it easy to discern the different functions by making the chronograph hands in black steel and the indicators of the perpetual calendar in rose gold tone. The movement on this timepiece is the CB1904 automatic caliber originally made by Vaucher and personalized by Carl F. Bucherer. The CB1904 carries an autonomy of 50 hours and it features a total of 49 jewels.